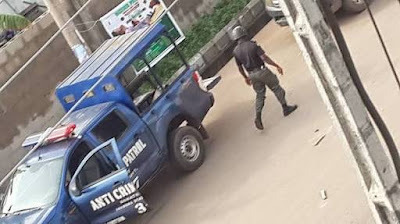 Wild protests erupted at the popular Ubogo Junction market in Udu Local Government Area of Delta State as the Chairman of the Vigilante group, Sunday Umukoro allegedly shot dead another member of the Vigilante Group from Otor-Udu, provoking tension in the area. The deceased, Mr. Kingsley Onajomo, aged 33 was accosted at night by the Vigilante chairman and shot in the chest leading to his death. Otor-Udu youths hit the streets in protests demanding for Justice in the matter. Unconfirmed reports have it that the Late Onajomo was visiting a lady friend at Emadadja, an ex-girlfriend to the Vigilante leader who was incensed that the deceased was dating his lover. According to the source, the suspect decided to teach the late Onajomo a lesson and the trigger he drew proved fatal in his rage. On getting winds of the development at dawn, Otor-Udu people mobilised to Ubogo community on reprisal mission but the suspect, who personally reported the incident to the Police at Ovwian-Aladja with claims that he caught the deceased with guns at night, was promptly arrested and whisked to Asaba for further interrogation. Chairman of Udu Local Government Area, Chief Jite Brown quickly alerted the police and other security agencies to mobilise to the area to avert a breakdown of law and order. At the popular Ubogo junction market, traders had a rough time with hooligans who capitalised on the tensed situation to harass motorists, block the junction and cart away goods from the market. Daily Independent reports that the situation was promptly brought under control by the police and the protesting youths asked to return home. The temperament and reaction of Ubogo community also helped to assuage the minds of the protesters as the community did not prepare for any fight but peace as they openly condemn the action of the vigilante chief. Meanwhile, President of Otor-Udu community, Mr. Peter Tini called for Justice in the matter. “On June 10 this year, one of our sons, Onome Oghenovo was killed at Egini. Now another from the same family has been killed in cold blood by Ubogo. "This is what triggered the anger of the youths and the wild protests. May this be the end of such situation in our community”, he added.